ONLY ON THE BLOG: Answering today’s six OFF-SET questions is Dr. William R. Harvey, president of Virginia’s Hampton University since 1978. His 33-year term is one of the longest tenures of any sitting president of a college or university in the country. After graduating from Talladega College, Harvey served three years on active duty with the United States Army, and he is currently a Lieutenant Colonel in the Army Reserve. 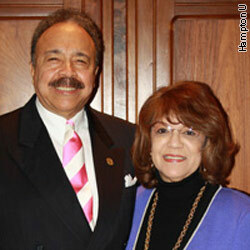 Dr. Harvey earned his doctorate in College Administration from Harvard University in 1972. Prior to assuming his current position, he served as Assistant for Governmental Affairs to the Dean of the Graduate School of Education at Harvard University; Administrative Assistant to the President at Fisk University; and as Administrative Vice President at Tuskegee University. You and your wife, Norma Harvey, just gave a gift of $1 million to the university you’ve been leading for three decades. First of all, how did you happen to have an extra million dollars in your account? In addition to being the President of Hampton University for 33 years, I have been 100 percent owner of the Pepsi Cola Bottling Company in Houghton, Michigan for 26 years. I am pleased that people in Michigan like Pepsi Cola. The money will be used to raise salaries for the Hampton teaching staff. Does every faculty get something? Will some faculty members be able to receive more? Every teaching faculty will receive 3 percent. Additional incentive pay will be provided to those who have published in refereed journals; received a public or private grant and have given significant service to Hampton University. How have faculty members reacted so far? Faculty members of Hampton reacted extremely enthusiastically when it was announced at the campus-wide faculty meeting on Tuesday, May 3. They gave a standing ovation. This is not the first time you’ve donated that sum. In 2001, you and Mrs. Harvey donated $1 million for student scholarships, dedicated specifically for high school students from Hampton and Newport News interested in becoming teachers. What was the return on your investment? In our small way we are increasing the number of professionals who are going into teaching. That is important because without good teachers there would be no physicians, lawyers, astronauts, professors, college presidents or businessmen or women. You were born in Brewton, Alabama in 1941—to say the least, a heavily-segregated Southern town. What is the greatest lesson that your father taught you about succeeding? My father, who only had an eighth grade education, was the smartest man that I have ever met. This includes men that I met at my alma mater Harvard. He and my mother taught me many lessons including the importance and value of an education. They taught me how important it was for a man to provide for and protect his family and that nothing beats a failure but a try, therefore always dream bold new dreams. 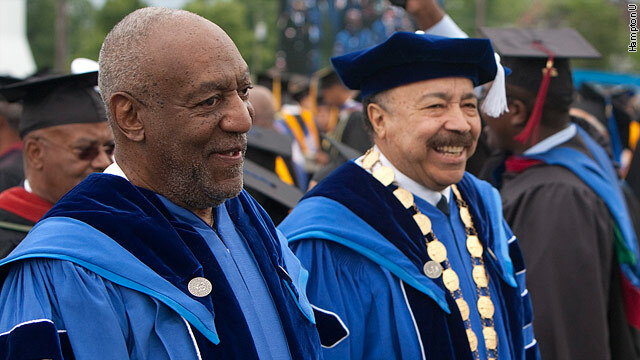 On Sunday, the actor and comedian Bill Cosby was the speaker at Hampton’s 141st annual commencement. Cosby, himself, has funded provided full scholarships to HU for four young men from Springfield, Mass. What did he tell graduates? Dr. Cosby teaches through humor and yesterday was no exception. He had some good advice to the graduates about taking responsibility for their actions and building a better life for themselves, their community and society. LOS ANGELES (Hollywood Reporter) - Roadside Attractions' music documentary "Thunder Soul" is getting a boost from Jamie Foxx. The Oscar-winning actor and singer will present the film for its September release. Directed by Mark Landsman, who produced along with Snoot Entertainment's Keith Calder and Jessica Wu, "Thunder Soul" tracks the alumni from Houston's famous 1970's Kashmere High School Stage Band as they return home after 35 years to play a tribute concert for their old band leader, 92-year-old Conrad "Prof" Johnson. The film had its world premiere at the 2010 SXSW Film Festival, where it won the audience award, and it's since been nominated for best documentary at the Independent Spirit Awards. Roadside Attractions picked up rights to the film in November. "I can't wait to share 'Thunder Soul' with the world so that everyone can enjoy this one of a kind experience," said Foxx, a music-education advocate who will serve as executive producer along with his FoxxKing Entertainment partner Jaime King. "It's such an entertaining and inspirational story that touches your soul and awakens the human spirit in the way that only love and the power of music can." Roadside Attractions has released the docs "Good Hair," "The September Issue," "Supersize Me" and "The Cove."